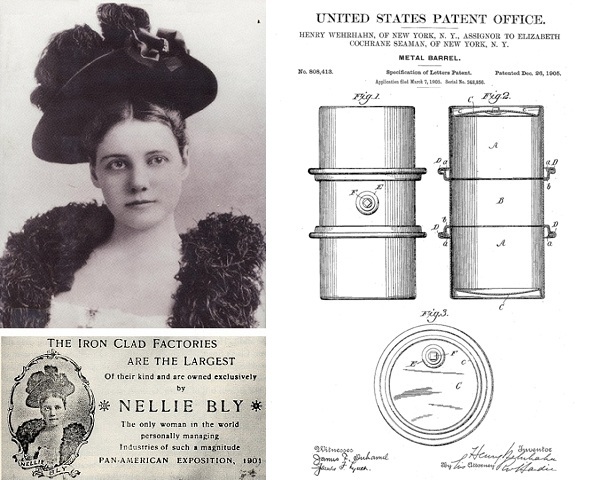 Recognizing the potential of an efficient metal barrel design, Nellie Bly acquired the 1905 patent rights from its inventor, Henry Wehrhahn, who worked at her Iron Clad Manufacturing Company. She became one of the most famous journalists of her day as a reporter for the New York World. Widely known as the remarkable Nellie Bly, Elizabeth J. Cochran Seaman (1867-1922), investigated conditions at an infamous mental institution, made a trip around the world in less than 80 days – and manufactured the first practical 55-gallon oil drum. January 1890 photo courtesy Library of Congress. For her first assignment as a reporter for Joseph Pulitzer’s newspaper, the New York World, Elizabeth Jane Cochran – young Nellie Bly – feigned insanity for 10 days in New York’s notorious Blackwell’s Island Asylum. She had been hired in 1887 to write about the mental institution. Writing under the pen name Nellie Bly (a character in a popular song of the time), her numerous exposés and adventures would capture the public’s imagination and make her a world famous woman journalist. In 1889, the New York World sent the 25-year-old Bly on a steamboat trip around the world to mimic Phileas Fogg in Jules Verne’s Around the World in Eighty Days. After a 72-day journey, she returned to New York to write a popular book. Much has been written about this remarkable woman from Cochran’s Mills, Pennsylvania, and her investigative reporting career with the Pittsburgh Dispatch and the New York World. There is an equally fascinating side of her – the “Iron Clad” steel Nellie Bly oil drum. Iron Clad Manufacturing Company President Elizabeth Cochrane Seaman received a 1902 patent for a stackable garbage can. In America’s oilfields, traditional wooden barrels had always been problematic for shipping oil. Despite the introduction of pipelines and railroad tank cars, there remained the need for manageable-sized, durable, leak-proof barrels. Standard Oil Company introduced a steel version of the common 42-gallon oil drum in 1902. It had the traditional cask-like appearance. Although stronger than wooden barrels, the new barrel could still leak. Nellie Bly had a better idea. Nellie Bly brought energy and ideas to Iron Clad’s Brooklyn, New York, factory. The company had established itself as a kitchenware manufacture as shown in this 1884 advertisement. Some questioned her management skills – but not her flamboyance – after her husband’s death in 1904, when she became the energetic and innovative president of his Iron Clad Manufacturing Company. During a 1904 visit to Europe, Nellie Bly saw glycerin containers made of steel. “I determined to make steel containers for the American trade,” she said. She patented her own “metal barrel” one year later. “My first experiment leaked and the second was defective because the solder gave way, and then I brazed them with the result that the liquid inside was ruined by the brazing metal,” she said. “I finally worked out the steel package to perfection, patented the design, put it on the market and taught the American public to use the steel barrel,” she added. Real credit must go to Nellie Bly’s employee, Henry Wehrhahn of Brooklyn, New York, who in December 1905 received two patents that would lead to the modern 55-gallon steel barrel. “My invention has for its object to provide a metal barrel which shall be simple and strong in construction and effective and durable in operation,” Wehrhahn explained in his patent, no. 808,327, a flanged metal barrel. The familiar encircling hoops allowed for guided rolling of the barrel for better control. Wehrhahn, who had entered the machinist trade in 1884 at age 18, became superintendent of the Iron Clad Manufacturing Company in 1902. He assigned his inventions to his employer, Bly, who also patented a milk can and stacking garbage can. “I am the only manufacturer in the country who can produce a certain type of steel barrel for which there is an immense demand at present, for the transportation of oil, gasoline, and other liquids,” she proclaimed. At its peak, Iron Clad employed 1,500 and could produce 1,000 steel barrels daily, but then charges of fraud led to bitterly contested bankruptcy proceedings, beginning in 1911. Nellie Bly was in Austria looking for financial backers when World War I began. Wehrhahn earlier had moved on to become superintendent of Pressed Steel Tank Company of Milwaukee, Wisconsin, by 1912. Iron Clad Manufacturing Company eventually succumbed to debt, and Bly returned to newspaper reporting, covering women’s suffrage events and Europe’s Eastern Front during the war. Her steel barrels ultimately became the ubiquitous 55-gallon steel drums of today. Elizabeth Jane Cochran Seaman died of pneumonia in 1922 – two years after the 19th Amendment secured her the right to vote. She was eulogized as Nellie Bly, “the best reporter in America,” by the New York Evening Journal. She should also be remembered for her unique contribution to America’s petroleum history. Also see History of the 42-Gallon Oil Barrel.